Fisher Hill’s English Literacy Program uses a structured literacy approach to teach reading and spelling. It was designed for Spanish speakers but can be used by anyone who wants to learn to read and spell in English. Structured literacy uses systematic and explicit methods to teach decoding and word identification. Structured literacy is beneficial to all students but especially to students who have had difficulty learning to read and spell. Structured literacy teaches phonology, sound-symbol, syllables, morphology, syntax and semantics. Phonology is the study of the sound structure in spoken words. This includes phonemic awarenes which is the ability to distinguish, segment, blend and manipulate sounds in words. Structured literacy teaches sound-symbol association which is the alphabetic principle: to associate sounds with letters. Structured literacy teaches syllables. Knowing the six syllable types helps students associate vowel spellings with vowel sounds. Syllable division rules help students to divide and decode unfamiliar words, especially longer words. Structured literacy teaches morphology which is the study of the meanings of the smallest units of language. Studying base words and affixes help students decode and understand the meanings of complex words. Structured literacy teaches syntax which is the principles that dictate the sequence and function of words in sentences. This includes grammar, sentence structure and the mechanics of language (spelling, captalization, punctuation). Structure literacy teaches semantics which is concerned with meaning. This includes comprehension of written language. Structured literacy uses systematic, cumulative, explicit and diagnostic priniciples to teach reading and spelling. This approach is very effective to all students, especially those who have difficulty learning to read and spell. Students like our workbooks because the pace is reasonable, print is large, there’s lots of pictures but the content is for older students and adults. Teachers like our books because everything is ready to go! 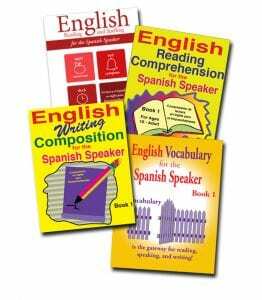 There’s an answer key at the the end of each lesson and an English translation of the Spanish directions at the end of each book. Visit our website at www.Fisher-Hill.com to learn more about our English Literacy Program.